Worlds are colliding. As Apple ramps up to enter the smart-glasses market, the French fashion stables and Italian eye-frame manufacturers are undergoing reorganizational upheaval in an industry already projected to be worth $165B by 2022. Read this tale of intrigue and double crosses; shifting alliances and stolen IP—from the catwalks of Milan to Silicon Valley; from Israeli military contractors to Parisian couture houses—learn of the Mediterranean billionaires and high-tech titans preparing for an epic battle for control of the ultimate interface—your own eyes. 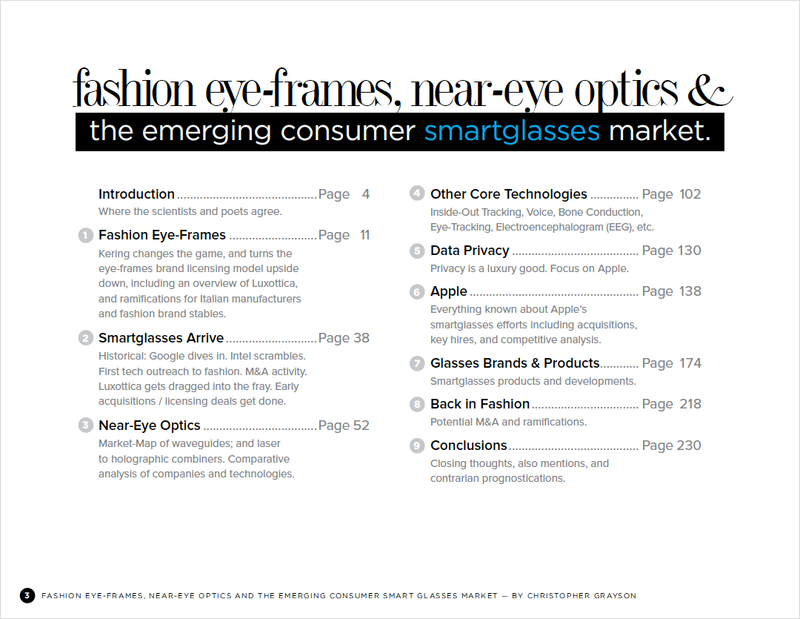 Fashion eye-frame, near-eye optics and the emerging consumer smartglasses market. See sample pages below the scroll. 250 pages with outbound links to over 350 sources. This report covers both the tech industry’s smartglasses developments, the fashion eye-frames and related industries; as well as points of convergence. Every effort has been made to write each section in as “plain-English” as possible, where it can be understood by experts and non-experts alike. • People in the smartglasses field who wish to have industry intelligence and learn where their business is intersecting with fashion and eye-frames. • People in the eye-frames industry who wish to have an understanding of how the tech industry may disrupt their own business. • Those in the tech industry, possibly already working in AR or VR, who may not be in smartglasses, and wish to be more informed about this side of the business. • Researchers and analysts in either media or investment who want industry intelligence. • Optometrists and other professionals in other related fields who wish to better understand developments that will soon impact their careers and business. Legal: For any facts or opinions included in this report, whether by this author or provided by third-parties—while best efforts have been made—Christopher Grayson makes no guarantees that information supplied is accurate, complete, updated or timely, and does not provide any warranties regarding results obtained from its use, nor should it be taken as investment advice. … and many many others. • 248 pages with outbound links to over 350 sources. • New information out of CES 2019. • Deep dive into the competitive market of near-eye-optics, with a focus on holographic waveguides, and laser to holographic combiner displays. • An entire chapter on Apple and their AR and smartglasses efforts. • Historical material on both the fashion eye-frames industry and the smartglasses industry that have brought us to where we are now. • Disruption happening in the eye-frames industry. • Supplemental chapter on related core technologies. • Timely chapter dedicated to issues of privacy. • Dozens of consumer smartglasses devices and startups profiled. • Short biographies on many key players. • Conclusions and opinions on the state of the smartglasses market. • 250 pages with outbound links to over 350 sources. The report contains information and analysis that you will not get anywhere else.